If your daily commute in Nairobi entails bracing yourself for more than an hour of traffic jam everyday and your data bundles cannot sustain you through that long wait or maybe bundles are not an issue but whatever is online is not as interesting, then there are some good news. 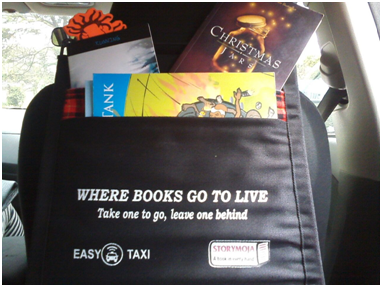 Easy Taxi has collaborated with Storymoja book publishers and Kwani Trust who have donated books towards “Where Books go to live’ campaign. Starting one neighbor hood at a time, Easy Taxi, Kwani and Story Moja, are seeking to give books a new home to thrive – inside of the taxis that move people day in and day out in Nairobi. Easy Taxi will spend 1 month in each neighborhood and for one day, a taxi cab will be installed with a mobile library that has a selection of different books. The target is to have 30 libraries installed in 30 days in 30 taxis in each neighbourhood. After this is accomplished, Easy Taxi will move on to the next neighbourhood. Every mobile library installation in every cab will be documented through photography and video that will later be shared with the rest of the world. Passengers will have the opportunity to either read the book in the cab or take it home, however they must leave a book of their own behind in the taxi or, they have the option of bringing a book into the next Easy taxi ride they take. The books will be held in beautifully designed book holders that are made to fit the back of any type of car. Each one will be made with a unique fabric. Easy Taxi will be launching a YouTube video this week featuring Angela, Director of Kwani Trust launching an Easy Taxi Library.